7.29 points at 21 votes (rank 265). 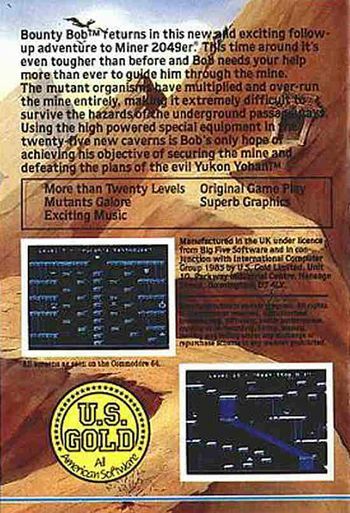 Rombachs C64 Game Guide 7 1986 - "Vote 3"
Bounty Bob strikes back is the second part of Miner 2049'er. The game idea is the same. Bounty Bob needs to chase the rouge Youkon Yohan through a deserted uranium mine. There are various mutants about which Bounty needs to pass. All the framework parts of a level need to be filled by walking over them so Bounty can go to the next level. On his way he needs to collect watering cans, flower pots, pickaxes and much more. The moving direction of Bounty Bob is controlled with the joystick. The fire button lets him jump. After the fire button was pressed the joystick can be pulled left or right to decide the jumping direction. The length of the jump is controlled by the time lag between pressing the fire button and pulling the joystick. To climb up or down a ladder, just stop directly in front of it and pull the joystick forwards or backwards. The ladder can only be left at the upper or lower end. To use a slide just go to the place where the slide starts, the rest is done by gravity. If Bounty Bob walks over the end of a platform he will fall. He only survives small differences in height. Pick up the flower pot, then press 1 + F7 to get to level 4. First destroy all enemies, then pick up the (inking) roller, then press 3 + F7 to get to level 22. Pick up the cup (in the upper left corner), then press 4 + F7 to get to level 15. Pick up the coffee pot, then press 8 + F7 to get to level 8. Pick up the fork (in the upper left corner), then press 4 + 5 + F7 to get to level 14. Set suction tube one to the left and pick up the cake, then press 9 + F7 to get to level 19. 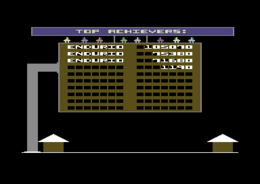 Rombachs C64-Spieleführer Teil 2: "Bounty Bob strikes back does not really strike back. 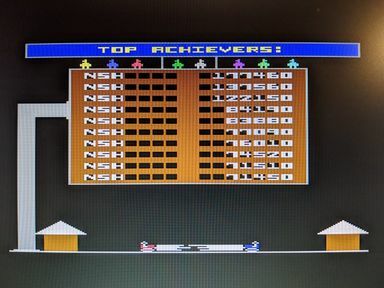 Except for the menu and the highscore list everything stayed the same. To those who liked Miner 2049er this game can also be recommended. But it is not really something new. 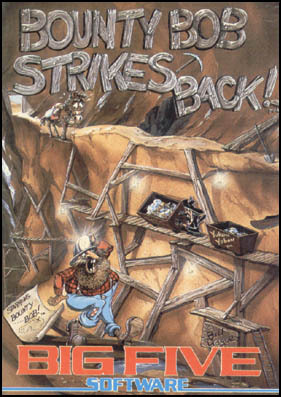 When released it was celebrated as a game sensation by different computer magazines. Voting: 3"
CSDb - Release No. 100412 Avatar Version "+7HD (PAL/NTSC)"